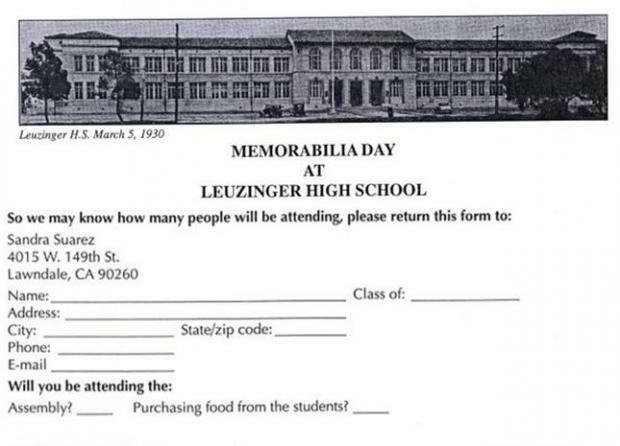 On Saturday March 3rd, 2007, The Leuzinger Alumni Committee will sponsor The 10th Annual Memorabilia Day. This will be my last year coordinating this event. Even though it has been fun, it's time for me to move on. Memorabilia Day is a great time for all alumni to visit their alma mater and meet with past friends and teachers. Meet in Student Council Chambers next to Cafeteria. Lunch will not be catered this year. Students will be selling food items. Please RSVP so that we may know how many people will be attending. Any alumni interested in speaking to the students in the classrooms on Friday March 2nd, please contact me at (310) 973-6169.